Two years ago, Novectacle released a visual novel called The House in Fata Morgana. It is an incredible experience and features a very deep, well-written story that analyzed many unspoken human emotions. Now, in 2018, a prequel to this game has arrived: The House in Fata Morgana: A Requiem for Innocence. What is given to us is yet another harrowing yet endearing adventure that is absolutely worth playing. It should be stated that Requiem is a visual novel, which means the main form of gameplay is in the form of reading. It is entirely linear, with no player choices to be made. It is also for people who have played the original Fata Morgana, as its story events rely heavily on the player’s understanding of the events of the first one. The story is partially digestible in its own right, but to play this game before the first would be doing a disservice to the author and your own self. It is a prequel, but one that is definitely meant to be played after the completion of Fata Morgana. There are 4 main components to this game: A Requiem for Innocence, the main focus of the game which comprises roughly 2/3rds of the material included; Tales Wasted Away in Obscurity, a collection of 3 short stories focused on various side characters; and Happily Ever ~After~, which is a completely lighthearted slice-of-life that follows the life of two characters from the first Fata Morgana in their new reincarnated lives. Each of these stories are worth reading, and they all come together to form one varied package. Not one of these stories feel particularly weak or unnecessary, as they all tell their own unique interconnected yet self-contained tales. There are also a few great bonuses that can be found within the game, such as an art gallery, music player, and a non-canon, fourth-wall-shattering story called Backstage where the main characters reflect on the events of the narrative. Both Backstage and Happily Ever ~After~ serve as a welcome breather after the thematically heavy stories that come before them. There’s a wide variety of content here. The main story, A Requiem for Innocence, focuses on the story of Jacopo and the titular Morgana, two characters from the first game who have a past together that was not detailed in the original. It is not a spoiler to say that this game’s story is a tragedy, as the players of the first game will know that things do not end well for our hero and heroine. The plotline follows their relationship over many years, and the various forms it takes. Unfortunately, to say much more could be considered to be a spoiler for both this game and the first one. But it can be said that the tale told is an engaging one, full of genuine human emotion. The theme of tragedy is still here, although the particular focus this time around is companionship, analyzing the ways ties between people can change. This story is perfectly bittersweet, with an emphasis on the sweet, and an extra emphasis on the bitter. Although, this is not a story that is merely clouded in sorrow and nothing else because there is much more here than a simple “tragedy”. Author Keika Hanada has crafted something special yet again. The prequel does a great job of bringing new depth to the characters and events of the first game and adds on many events with a pleasing amount of detail and accuracy to the original tale. In essence, Requiem does everything a good prequel should do, and more. The new supporting characters that are introduced feel like genuine three-dimensional people. The main cast of characters found in the first act, in particular, deserve special recognition for their natural chemistry. Even characters that may seem irredeemable on the surface are given motivations and reasons as to why they act the way they do. Even more impressive is the fact that there is not a throwaway character to be found, as every single character in the story serves a distinct purpose in progressing the game’s plotline. It is also worth noting how complex the story becomes, while simultaneously remaining easy to follow. Readers will never feel lost while playing Requiem; and if they were to feel lost, it would be a feeling of being lost in an immaculate sense of immersion. From an aesthetic standpoint, Requiem’s art is still astonishing. From the detailed character portraits to the incredible setting artwork that is featured in the background of each scene, there is always something to marvel at being presented. It is not hard to imagine that just as much time was spent crafting the visuals of this game as the story itself. The same can be said for the soundtrack. There aren’t as many music tracks in this game as the original title, though this is understandable due to the fact that the main storyline is roughly half the length of the original (it will take somewhere within the range of 10-15 hours to read, plus roughly 5 for the side stories). 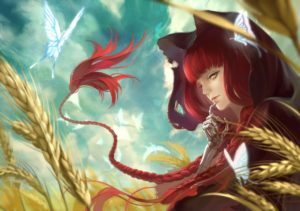 The music is composed by a large number of different composers, all of which manage to craft songs that fit the alluring yet tragic world of Fata Morgana. From beautiful piano pieces to sweeping, epic ballads, there is never a dull moment to be heard. Once again, many of the tracks feature the elegant vocals of Japanese singer Gao. The perfect atmosphere for each and every scene is conjured by this game’s stellar songs, several of which manage to be breathtaking. If you haven’t played The House in Fata Morgana yet, then please do that, and then play A Requiem for Innocence if you want to understand more about the game’s world and characters. The way this prequel manages to tell its own character-rich story while simultaneously existing as a companion piece to another story is truly impressive. While the main story itself is not nearly as epic in scope as its predecessor, it doesn’t really need to be. The first Fata Morgana is an inherently difficult game to follow up, and players should not go in expecting another experience on that same scale. The grand tale has been told; now it is time for something more intimate. The words of this story will not be easily forgotten. 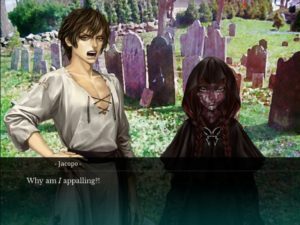 The short version of all of this is: If you played through The House in Fata Morgana and enjoyed it, then A Requiem for Innocence should not go unnoticed. Well done, Novectacle.